Yesterday my fantastic Aunt Marty graced us with her company for a few hours, and we decided to take the munchkin and go peach-picking. I’ve never gone out and picked my own fruit before, believe it or not (and shame on me for living in Oregon for 13 years without taking advantage of all the u-pick orchards and berry farms! ), so it was an interesting experience. We chose Daum’s Produce essentially out of a hat, threw some paper bags in the car, buckled down the baby, and took off. This farm is 9 miles north of West Salem, and I think it took us longer to drive up there than it did to pick 10 pounds of peaches so ripe that they bruised under their own weight on the car ride home. I promptly diced up the most damaged specimens and chucked them in the crockpot to make peach butter (more on that to come), and another bowlful got blanched, peeled, and sliced up for peach cobbler. I’ve never been a big fan of the biscuit-topped variety, so I decided to make a double-crusted cobbler instead. This variant, which layers peach filling with a piecrust-like dough, sounded to me like the best of both worlds. I cut my top layer into stars just for fun, and glazed them with heavy cream and a sprinkle of sugar for color. The finished cobbler, with its crisp top crust and softer inner crust, reminded me a lot of my apple dumplings, which tend to stay crisp on top and get all gooey in the syrup forming underneath. 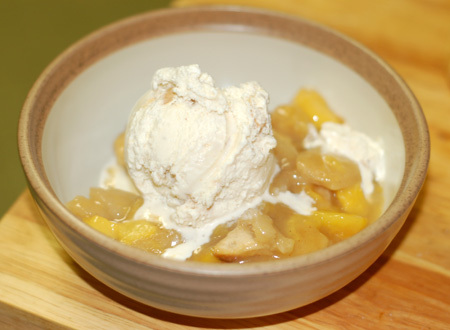 We served it warm with a scoop of leftover almond ice cream, and it tasted like summertime at home: sweet and tangy, crisp and gooey, hot and cold, and smelling of cinnamon. This post is linked up with Two for Tuesdays. For the pastry, combine flour and salt; cut in shortening with pastry blender until mixture resembles coarse meal. Sprinkle cold water (one tablespoon at a time) evenly over surface. Stir with a fork until dry ingredients are moistened. This process can also be done via food processor. Shape into a disc; wrap in plastic wrap and chill. For filling, combine peaches, sugar, flour, cinnamon and nutmeg in a large saucepan; set aside until syrup forms. Bring peach mixture to a boil; reduce heat to low, and cook 10 minutes or until the mixture has thickened slightly and the peaches are just tender. (Try not to let the peaches get too soft, as they will continue cooking in the oven.) Remove from heat. Add extract and butter, stirring until butter melts. Spoon half of peaches into a lightly buttered 8-inch square pan or 2-quart dish. Roll half of pastry to 1/8-inch thickness on a lightly floured surface; cut to fit your pan, or use a biscuit cutter to cut out rounds. (This layer won’t be visible in the finished cobbler, so it doesn’t really matter; you could probably just tear off chunks once the dough is rolled out.) Layer the pastry over the peach filling, and bake at 475F for 12 minutes until lightly browned. Spoon remaining peaches over baked pastry. Roll remaining pastry out to 1/8-inch thickness, and cut out shapes to overlap on top of the peaches, or cut strips and arrange in a lattice design. Brush with heavy cream and sprinkle with a bit of extra sugar if desired. Bake an additional 15 to 18 minutes or until browned. Allow to set for at least 15 minutes if you can bear it, and serve warm with ice cream. Source: Slightly adapted from GroupRecipes. Glad you posted this recipe. 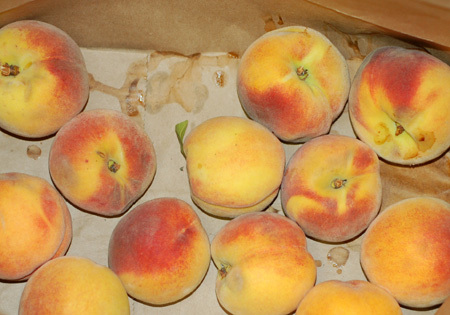 I just picked up a box of peaches at a local farm. Since I’ve already made peach butter (actually peach mango) I’ve got to figure out a few other things to make with them. Cobbler sounds great! The star cut-outs are adorable. I have a peach tree in the backyard, and thankfully it’ll probably be another month before it’s ready to go. But I am sooo looking forward to it. Thank you for linking up with Two for Tuesday. p.s. I make peach butter, too. I make “butter” from everything. It’s a trick I learned from my mom. When she was tired of dealing with a fruit, she chucked it into the crockpot with a bunch of spices and let it go for a day or so. Girlichef, you can expect a series of peach butter posts coming very soon! Penny, I’m still working out what to make with the last dozen or so of my peaches, which weren’t so squishy ripe as the rest. It’s the best sort of dilemma, isn’t it? Peach-mango sounds like a fantastic combination! Oh peach heaven! 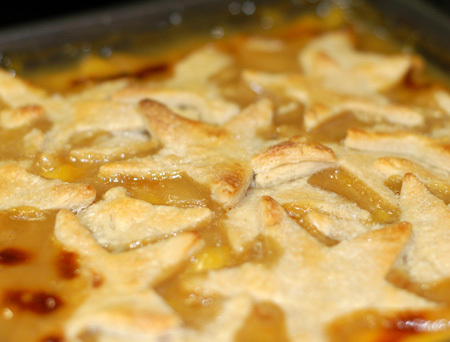 I rarely do anything but eat them out of hand but darn that cobbler with its little stars looks out of this world! Thanks for linking this to Two for Tuesdays! Alex, thanks for stopping by! There’s nothing quite like the combination of baked fruit and crust, is there? Especially when ice cream comes to the party!